The Sunday Marvel Universe block on Disney XD gets a little more godly with the inclusion of Thor. And he’s not the only God of Thunder scheduled to make an appearance. Jeph Loeb, Marvel’s EVP / Head of Television, spoke to me recently about Thor’s appearance in Ultimate Spider-Man and also answered some questions about The Avengers: Earth’s Mightiest Heroes . GeekMom: Hi Jeph! Thanks for taking the time out to talk with me. Lets talk about Ultimate Spider-Man for a minute. Where and when did the Throg idea originate? Jeph Loeb: We’re huge fans of the Walter Simonson run on Thor . And who doesn’t love Throg? 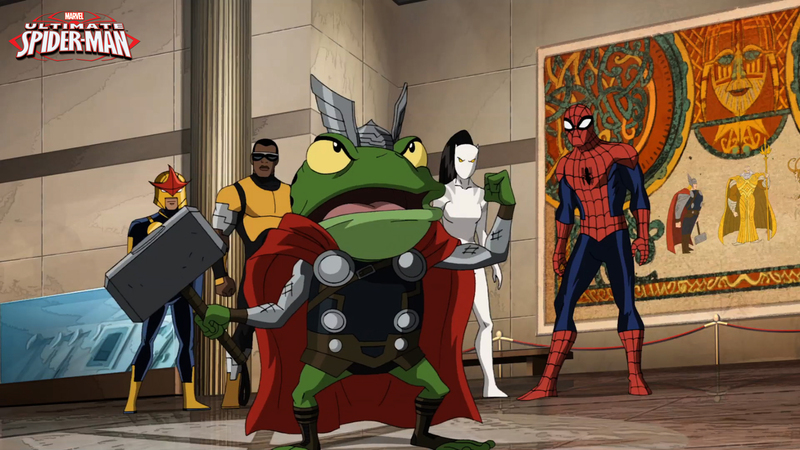 You get all the hubris and power of Thor in the body of a frog! JL: Well … without telling — we love the Avengers — and so it’s pretty certain that Hulk, Iron Man, Thor and even Captain America will be stopping by. And what’s a Thor story without Loki’s mischief? GM: Let’s shift gears and talk about Thor’s appearance in The Avengers: Earth’s Mightiest Heroes . How did you decide to incorporate Beta Ray Bill into the series? GM: In regards to both Ultimate Spider-Man and The Avengers: Earth’s Mightiest Heroes , how do you determine how to establish the style and character of Thor in each of the two series? JL: It’s a learning curve. Each series we produce will reach for the next level of animation and get closer to the superb work we find in Marvel publishing. It all starts in the comics and with the astonishing vision from the films, it creates an enormous challenge in television to try and capture that magic. GM: With the comedy in Ultimate Spider-Man and the action in The Avengers: Earth’s Mightiest Heroes , which do you think is more reflective of the Marvel Universe? Check out Marvel Universe XD this Sunday and watch as Thor takes over the Ultimate Spider-Man and The Avengers: Earth’s Mightiest Heroes.